Like go-karts, the first minibikes were made by enthusiasts from spare parts found in their garages. They were first popularly used as "pit bikes", for drag racers to travel around in the pits during races in the late 1950s. They were very useful for this purpose, as they could maneuver very well in the tight pit roads, fit in about the same space as a small bicycle in a trailer or pickup, and they were faster than most previous forms of transportation. As racers brought them home and used them around their neighborhoods, many children liked the idea of having a "mini motorcycle" and started building their own. A market for minibikes developed and many cottage and major industries developed to meet the demand. 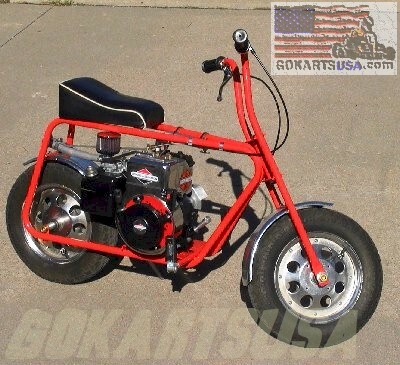 Famous minibike companies include Arctic-Cat, Rupp, Taco, Heath, Gilson, and Fox, many of which also made other power toys such as go-karts, trikes and choppers. The height of the minibike/go-kart era was from the late 1960s to the early 1970s in America. Many of the famous brands, foremost Rupp, have gained a cult-following of enthusiasts and owners.